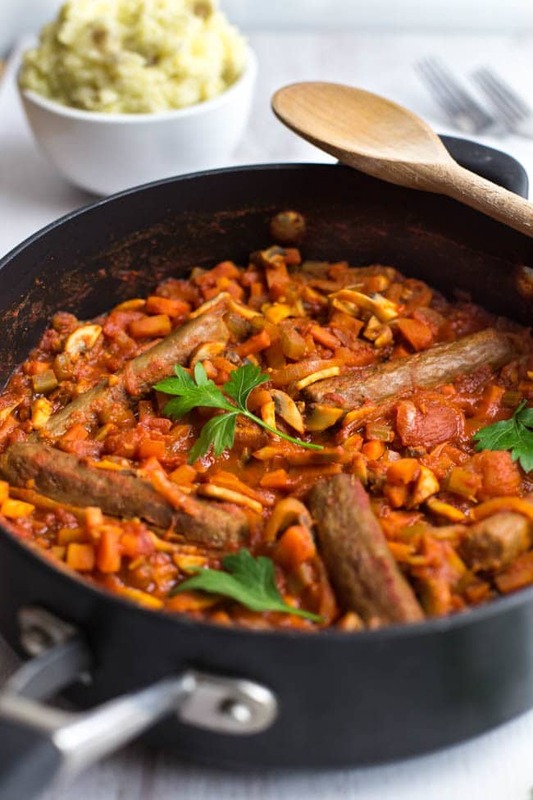 I don’t often share cookbook reviews here (very rarely, in fact), but I’m making an exception today and sharing this vegetarian sausage casserole recipe from the new cookbook Hungry Healthy Happy. The reason is that it was written by one of my favourite bloggy friends, Dannii Martin from the blog of the same name. I’m so excited for Dannii… and also excited that I get to delve into the recipes, and share one of them with you today. Dannii’s book is based around the same ideas as her blog; it’s healthy food that doesn’t make you feel like you’re missing out on anything. She’s all about balance, and making small dietary changes to improve your health. There are heaps of recipes in the book that tickle my fancy – homemade strawberry jam, breakfast burritos, courgette fritters, Mexican rice, spicy lentil tacos, lemon squares… to name but a few. Unlike a lot of ‘health food’ books, the recipes use easy-to-find, everyday ingredients – there’s nothing that sounds totally alien. This isn’t a vegetarian cookbook, but there are plenty of yummy veggie recipes included (Dannii’s never shied away from a lentil), and many more can be adapted to be vegetarian. 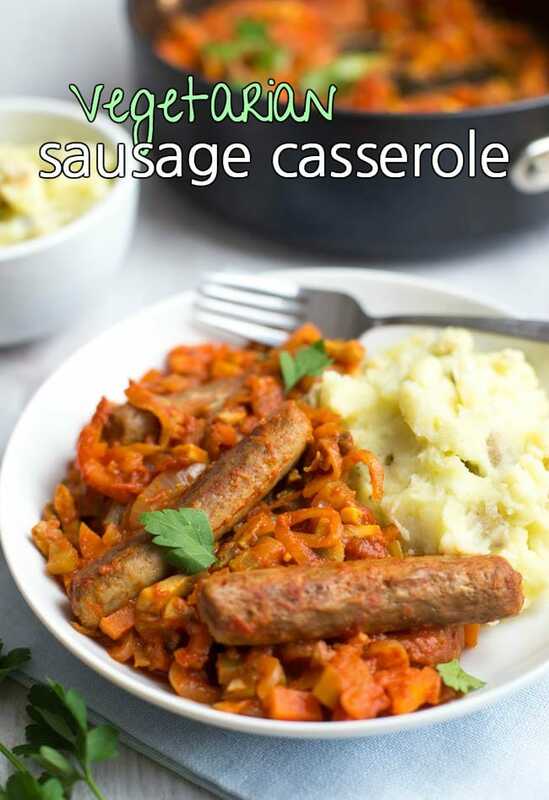 For example, in the book this sausage casserole isn’t specifically vegetarian, but it was very easy to swap in my favourite vegetarian sausages. The end result is a rich, tomatoey casserole that’s packed with vegetables and lean protein. Comfort food made healthy! 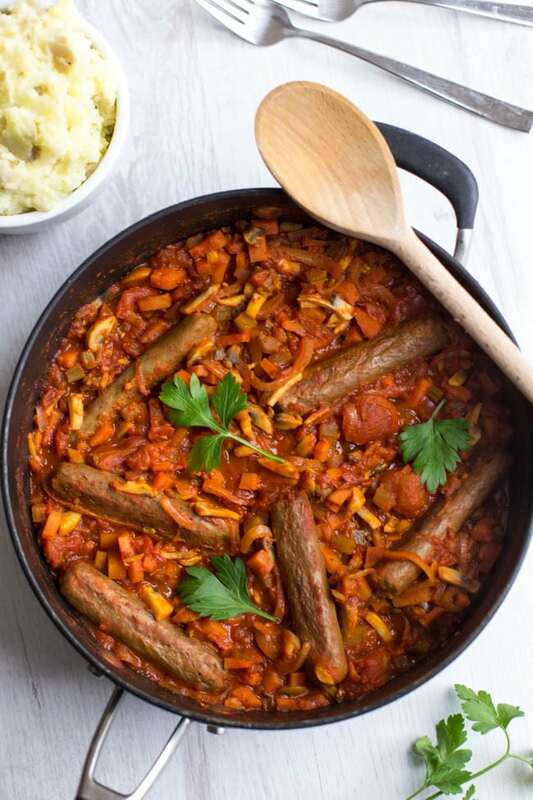 The sausage casserole is really easy to make. The sausages are cooked in the oven, which means you can focus on making the sauce, helping to speed things along. The tomatoey sauce is built on a base of celery, carrots, onions, mushrooms, onion, garlic… You’re getting towards your five a day without needing to go anywhere near a lettuce. Then you just add a tin of tomatoes and the cooked sausages, and leave everything to cook down into a thick, rich sauce. It’s seriously tasty, especially served alongside some creamy skin-on mashed potato. Comfort food at its finest. Cook the sausages according to the instructions on the packet - probably something like 20 minutes in an oven set to 190°C (Gas Mark 5 / 375°F). Meanwhile, heat the oil in a large saucepan, and add the onion, garlic, mushrooms, celery and carrots. Cook over a medium heat for 5 - 10 minutes, until the vegetables are soft. Add the remaining ingredients to the pan, and mix well. Simmer over a medium-low heat, stirring occasionally, until the sausages are ready. Add the cooked sausages to the sauce, and cook for another few minutes, or until the sauce has reached your desired consistency. Recipe barely adapted from Hungry Healthy Happy by Dannii Martin, photography by Jacqui Melville. Published by Jacqui Small (£20). Shared with permission. Got a few vegetarian sausages left over? 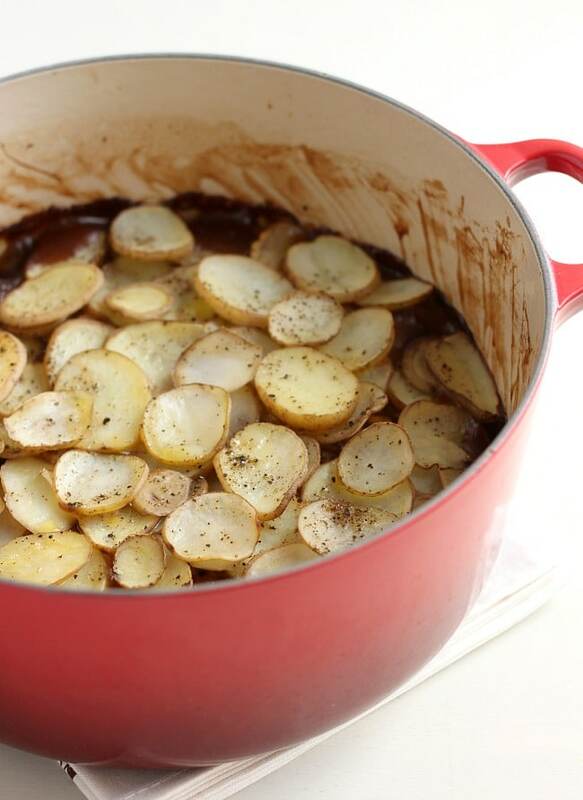 My vegetarian sausage hotpot is a British classic. 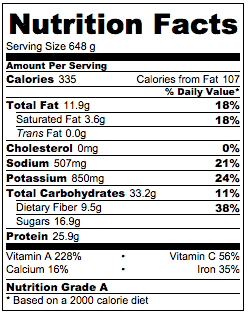 So many nutrients in one dish – love it! This is perfect for meatless Monday. I’d add some zucchini and parsley too, sounds like it’d be a good mix. Let you know how it turns out. Thanks for sharing. That looks amazing, and it is vegan too which is perfect for us as my youngest has allergies and we are always looking to expand our regular meals. Oh gosh this looks too tasty, will definitely be making it soon! This looks and sounds delicious, I don’t often use vegetarian sausages when I make a meal but my family all love them and I’m sure they would love this. This looks ace! 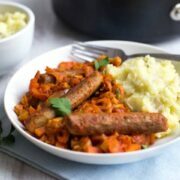 I love a sausage casserole, but my daughter won’t eat regular sausages as she has a thing about the texture and the thing – vegetarian sausages could be a great alternative. 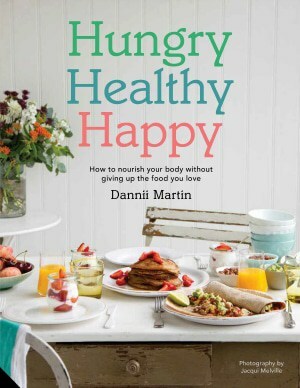 I’m loving Dannii’s book too… so many deliciously tempting recipes that make you forget that they’re healthy! 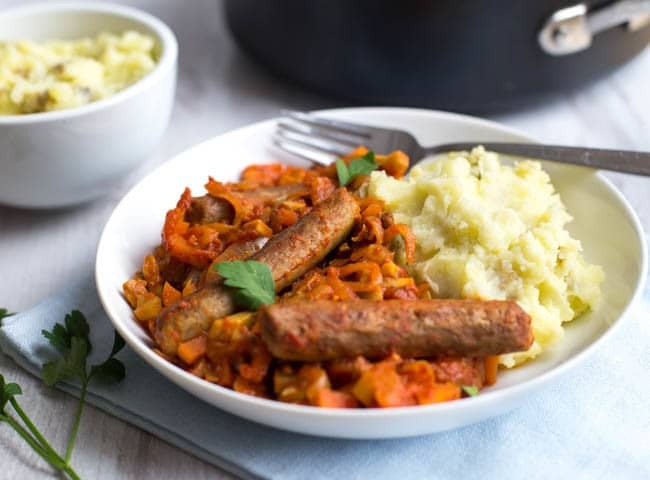 This veggie sausage casserole looks wonderful… and with the weather showing no sign of cheering up, I think would be perfect to cook this week! Ugh it’s been so miserable today! Definitely a day that calls for comfort food! I’m no vegetarian, but I would not pass up this dish. Sounds flavourful and hearty. A delicious, flavorful options for vegetarians. I am not a vegetarian but am loving the ideas and the flavors of the tomato base. I think this would work with merguez sausages wonderfully too. I’m a vegetarian and I would surely relish this dish! So flavourful and colourful too!